Whether you are looking for Women’s Moccasin Knee High Boots or Women’s Moccasin Ankle Boots we’re confident our 100% American made moccasin boots are sure to please you. Ankle high Chukka Boots are handmade moccasin boots crafted from deerskin leather or cow hide and are designed for walking comfort. Our Knee High Deerskin Moccasin Boots are handcrafted using over twelve feet of supple, lightweight deerskin leather providing unbelievable comfort. Knee high boots can also be made from cowhide! 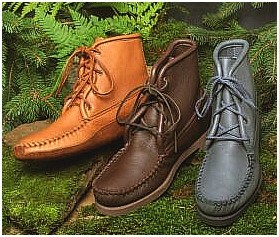 Deerskin moccasin boots are unsurpassed for flexible, breathable, lightweight comfort. Since they mold and contour to your feet naturally, knee high moccasin boots are ready to wear because there's no need to break them in. Footwear by Footskins carries a great selection of men’s moccasin boots including Men’s Ankle High Chukka Boots, Men’s Cowhide Knee High Boots and Men’s Deerskin Knee High Moccasin Boots. Men’s chukka walking boots are ideal for casual dress, travel, or outdoor activities, such as black powder shooting, archery, or camping with friends. These comfortable deerskin moccasin boots are also great for people with problem feet. 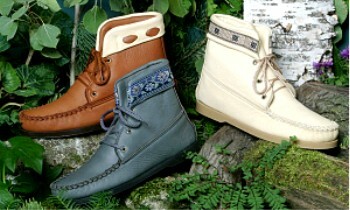 See our Men's Crepe Sole Walking Boots or our Men's Canoe Sole Walking Boots. Men's deerskin moccasin boots are double layer deerskin leather with a cushion insole. The soles are either a sturdy crepe sole with heel or a third layer of thick cowhide suede with an extra leather insole for longer wear. As with the women's version, there is no "breaking in" needed for these deerskin moccasin boots. Check out our selection of children’s moccasin boots and shoes including Children’s Teepee Moccasin Boots in Crème Deerskin, Children’s Saddle Deerskin Moccasin Boots and Children’s Colored Fringe Teepee Moccasin Boots. 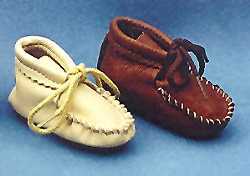 We also carry Infant And Toddler Deerskin Moccasin Boots or "baby booties" with or without trim. Our single layer Deerskin Baby Booties tie securely and have soft leather insoles. Those with trim include a colorful braid for an added special touch. For more information on our deerskin moccasin boots including men’s moccasin boots, women’s moccasin boots and children’s moccasin boots please Contact Your Handmade Leather Moccasins Representative or call us at 507-498-3707 weekdays, 8:00 – 5:00, CST. See our Men's Deerskin Boots! © 2017 Footwear By Footskins®. All Rights Reserved.